Oil your ramekin (or silpat cup or muffin tin). 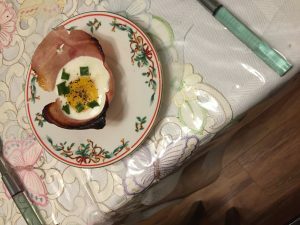 Place the ham inside of it, making a nice cup. Crack your egg into the center. Top with green onion and cheese (optional). Pop onto your plate and serve. In a medium bowl, beat the eggs with a pinch each of salt and pepper. Melt the butter in a medium nonstick skillet over medium heat. Add the eggs and cook, stirring and tilting the pan, until just set, 2 to 3 minutes. Sprinkle with the spinach, sun-dried tomatoes, and Feta; fold the eggs over the filling. Transfer to a plate and serve with the bread.